Comedy Central’s Stephen Colbert found himself at the center of a controversy on Thursday stemming from a racially insensitive tweet posted to The Colbert Report Twitter account. The well-known satirist tried to distance himself from the tweet (now deleted) early Friday morning – even though it was almost a direct quote from his Wednesday night show. The Colbert Report Twitter account may not be controlled by Colbert. Indeed, the people behind the account called it “a Comedy Central promotional account, with no oversight from Stephen or his show.” But here’s the thing – their offensive tweet was based on a line that came straight out of Colbert’s mouth on his Wednesday night show. During that episode, Colbert was poking fun at Washington Redskins owner Daniel Snyder for creating the Washington Redskins Original Americans Foundation. The host ridiculed it as an attempt to dispel criticism of the team’s nickname, which some find offensive to Native Americans. Now, folks, the small-minded out there have called Ching-Chong Ding-Dong an offensive caricature of an Asian-American. That is wrong. Mr. Ding-Dong is not American. He is a Chinaman from Guangong, and if he ever heard someone call him a stereotype, he would choke on his opium pipe. But I am willing to show the Asian community that I care by introducing the Ching-Chong Ding-Dong Foundation for Sensitivity to Orientals or Whatever. It is a wonderful charity. That was the basis for the controversial tweet. I don’t know how Colbert expected to distance himself from the tweet if it was a near-quote of his own words. The Colbert Report Twitter account put out a new tweet on Friday with a link to the video of the offending segment from Wednesday’s show. They said they were providing “context” – as if that context makes the line less offensive. STEPHEN COLBERT: Folks, this move by Dan Snyder inspires me because my show has frequently come under attack for having a so-called offensive mascot. My beloved character Ching-Chong Ding-Dong. COLBERT: Oh, I ruv tea. It's so good for you. You so pretty, American girl. You come here. You kiss my tea make her sweet. I need no sugar when you around. Come on my rickshaw, I give you a ride to Bangkok. 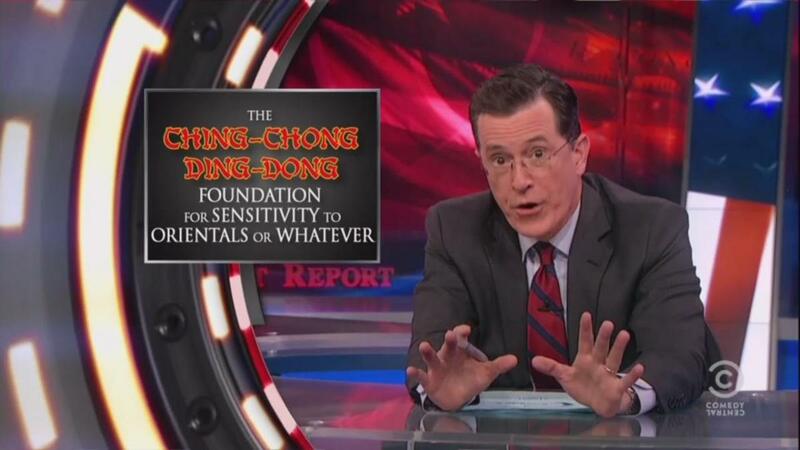 COLBERT: Now, folks the small-minded out there have called Ching-Chong Ding-Dong an offensive caricature of an Asian-American. That is wrong. Mr. Ding-Dong is not American. He is a Chinaman from Guangong, and if he ever heard someone call him a stereotype, he would choke on his opium pipe. Of course, there is no pleasing the attack dogs over at Asian Media Watch who demanded that I remove Ching-Chong from the show's letterhead and stop having him accept awards on my behalf. The point is, the point is, offensive or not-- not-- Ching-Chong is part of the of the unique heritage of the Colbert nation that cannot change. But I am willing to show the Asian community that I care by introducing the Ching-Chong Ding-Dong Foundation for Sensitivity to Orientals or Whatever. It is a wonderful charity. Thank you. [Applause] I will applaud my sensitivity as well. It's a wonderful charity that's already provided 3,000 of those triangle hats to Asian Americans in need. I assume there's a need because I never see them wearing those things anymore. And I owe all this sensitivity to Redskins owner Dan Snyder. So, Asians, send your thank you letters to him, not me. We'll be right back.